PLENTY of people here reckon their job is far from perfect - so many, in fact, that Singapore's workforce ranks as the second most dissatisfied in the Asia-Pacific region. A new survey shows that 54 per cent of those polled here are unhappy at work, just behind Japan, where 56 per cent of employees feel that way. It is a far cry from India, which topped the list globally with 80 per cent of workers there saying they have the perfect job. The quarterly survey conducted online by global recruitment firm Randstad polled around 13,200 people between the ages of 18 and 65, including 5,670 here. The results clearly show that workers do not feel engaged at the workplace, said Mr Erman Tan, president of the Singapore Human Resources Institute. "Rising costs place the pressure on workers to constantly look for jobs that have better salaries... bosses need to provide a listening ear. Even if they cannot afford to give higher salaries, open, sincere conversation will help to mitigate some issues." 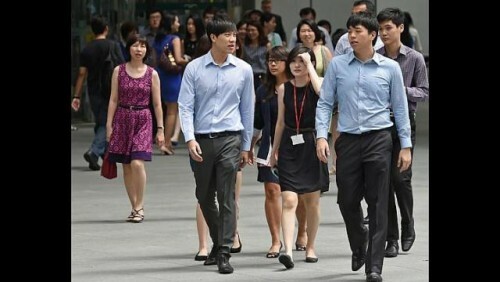 Workers themselves must also be proactive in highlighting their problems, noted Mr Tan. Randstad Singapore country director Michael Smith agreed that organisations need to recognise their workers' needs. "Understanding what motivates employees... will not only allow employers to better engage with their staff, but also increase their employees' job satisfaction and, as a result, the productivity of their workforce," he said. The survey also found that 75 per cent of workers here see their job as a way to make a living and nothing more. This is not necessarily a bad thing as people want to provide for their family, said Mr Marc Leoi, who helms local breakfast chain Ya Kun. "Everyone needs to put food on the table, but different people have different motivations. While employers do all they can to engage and motivate, staff should also... acknowledge the effort put in by the company," he added. Mr Smith said workers should "look beyond remuneration" to consider other factors such as job satisfaction and career progression opportunities. The poll also found that 80 per cent of those quizzed here said they would switch jobs if they could make more money elsewhere, while 78 per cent would do the same for better career opportunities, and 71 per cent would jump ship for a job that better matched their educational backgrounds. For Ms Jenny Lim, a 25-year-old administrative assistant, pay is still the primary driver. Other factors are "good to have, but not crucial", she said. "I think most people will skip from job to job and never find the one they really love... but if you ask me if I want a better-paying job, the answer is always yes."